The exhibition, The hunt for absolute zero, in the Museum Boerhaave in Leiden, tells the story of a couple of remarkable pioneers entangled in a race to the extreme: absolute zero. A place so cold that the usual laws of physics no longer apply. A place everyone knows can never be reached&#65533; The hunt for absolute zero is the first international exhibition about the research into artificial cold. Original telegrams, laboratory interiors, working pumps and old photographs bring the heroes to life and give a striking impression of the rivalry between the two driven scientists, the one moment moving, the next sad or ridiculous, but always surprising. 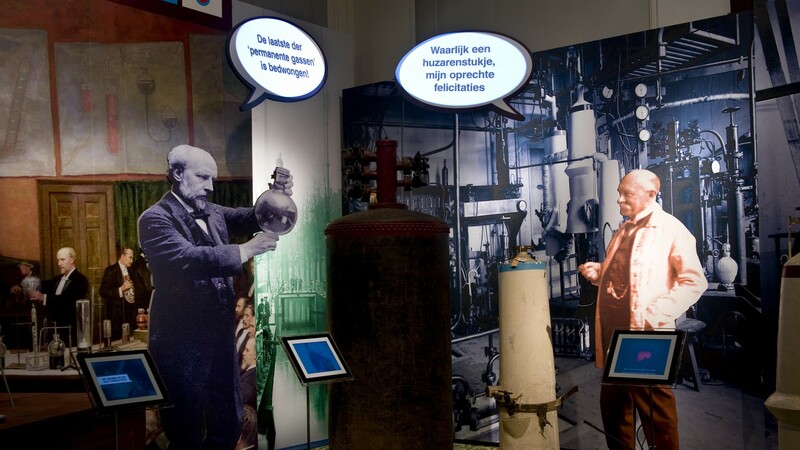 The original 'thermosflasks' in which James Dewar succeeded in making hydrogen liquid, have never been exhibited in the Netherlands before. The original pressure 'bottles' in which Kamerlingh Onnes manufactured liquid helium are here as well. The exhibition also includes authentic film material, humorous animations and hands-on games which illustrate principles of physics which the rivals had to deal with.